When I bought my laptop (an Apple MacBook Pro) several years ago, I powered it on for a few seconds to make sure it at least booted, then shut it down and replaced the stock 500GB drive with a 1TB drive of my own, then installed the OS. It worked great, but after a few years the machine started to feel sluggish, as if I was suddenly using Windows. The disk I'd put in was big, but also slow (5,200RPM), so maybe I'd reclaim some speed by using an SSD (solid-state disk)? When I realized that I could replace the DVD drive with a disk, and found that Other World Computing had 480GB SSDs, I took the jump. After carefully checking the compatibility charts, I got Other World Computing's DIY Bundle: 480GB 6G Solid State Drive + DVD-drive-space mounting hardware, along with a USB enclosure to put the laptop DVD drive currently sitting where the new disk will go. The install instructions, on the other hand, were a bit lacking. I kept a set of notes on the problems I came across, but having let two months pass before getting around to writing this post, I can't find them. However, I do recall a representative problem: while the computer was splayed open on the table, with the bottom now the top and the front now the back, the instructions would use directional words (“front”, “behind”, etc.) with respect to the computer as if it were set up for normal use, instead of with respect to the current view of the thing you were instructed to have before you. 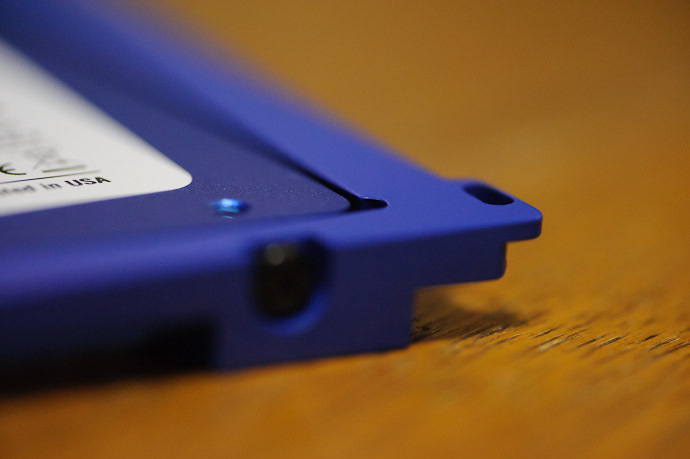 I wanted to use the new SSD as the root drive, so I needed the just-removed DVD drive to reinstall the OS, so I popped it into the fairly cheap plastic case, and it worked fine, though its build quality is a bit lacking... the disk doesn't slide in and out very smoothly. The machine is now quite fast in many ways... I can reboot (invoke a shut down, then restart back to the login prompt) in 18 seconds. I run a disk speed test with uncompressable data and see real write speeds of about 235 megabytes/second, with read speeds of 265 megabytes/second. This compares to hard-disk numbers of about 85 for both read and write. Lightroom is also faster, but the develop module can still be really slow for me, much worse than a year ago. I don't know whether the problem is related to something bad with my system, or with Lr4 being that much slower than Lr3, but I've heard sporadic reports along those lines, so maybe I'm getting bit that way. OSX'x “DVD Player” app won't work with the now-external formerly-internal DVD drive. I always use VLC anyway, so this is a non-issue for me. The external DVD housing comes with a funky “Y” USB cable. You can use any old USB cable when watching movies, but you need to plug two ends of the “Y” into the computer to get enough juice to actually burn a disk. I don't do that often, so have to remember to get the special cable each time. I've been using it all without problem for the last two months, so I thought I'd finally write about it. I too have moved to SSD for lightroom. I found it was faster for lightroom but then it got slower again. After deleting all my previews and having it start from scratch rebuilding the preview database it was faster again. Also, did you set your camera raw cache to the SSD? Just a general comment that you might already be well-aware of. If you have another Mac with a disc drive you can use disc sharing over the network to take care of watching or burning that way. It’s usually a little nicer watching a movie without having the machine I’m in front of spinning away loudly on an external disc. To get DVD Player to work again, you can edit the binary file /System/Library/Frameworks/DVDPlayback.framework/Versions/A/DVDPlayback and replace all instances of “Internal” with “External”. 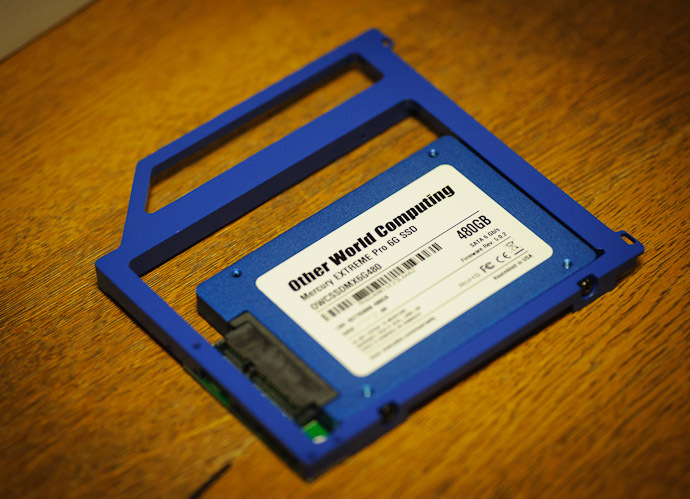 I’ve been running with an OWC SSD in place of the DVD for quite a while now, and it’s made my Mac a lot more pleasant. I configured my old drive to mount as /Users/Shared, and moved things like my iTunes library, virtual machine images, and Downloads folder over there. Jeffrey, be careful when you talk about “sluggish, as if I was suddenly using Windows”. With my Windows machine if it took 18 seconds to reboot to the login prompt I’d go looking for a problem. It is just under 12 seconds. Old Macs like yours are slower than current Mac OS and current Windows machines. Once again more modern systems have moved to USB 3.0 which makes backups etc. a practical reality with external drives. There have been several people complaining about sluggish performance on lightroom 4 vs. lr3. This, in my case, was mainly attributed to a corrupt preference file. Mind you, I’m running windows so the fix of deleting preferences and rebuilding preview database may not apply, but even after these “fixes” I still find LR4 quite a bit slower than LR3 in developing mode. So it could be just optimising quality while losing performance. Can you tell me where I can find the compatibility charts you talking about? If Firefox is slow for you, it may be due to your long-used Firefox profile. The new version of Firefox includes a simple profile reset mechanism that you may want to try. Lifehacker covered this earlier this year. If you’re concerned, you can also make a new profile and then use Firefox Sync to migrate your settings from your old profile to your new profile. If you’re a long time Firefox user, profile cruft really slows Firefox down which is why this feature was added. I’m not sure if about:config settings get moved, I sort of doubt it. I can find out for sure if you’ve heavily customized your Firefox via about:config. I’ve confirmed that about:config settings are not migrated with the Reset feature. Still, I suggest you try a new profile so you can see how much that affects the speed.